The Zeiss Batis 85mm f/1.8 offers a short telephoto focal length and a fast aperture that’s ideal for portraits, events, weddings or studio fashion photography work. Construction is a durable and weather-resistant all-metal casting, and at 105mm long and weighing 475 grams, it’s a fairly chunky lens for the Sony A7 series. Optical construction utilizes 11 elements in 8 groups, including 3 low-dispersion elements, and the 9-bladed circular aperture diaphragm promises attractive out-of-focus bokeh effects. An addition to autofocus, the feature set of the Zeiss Batis 85mm f/1.8 has been further bolstered with built-in image stabilization. The Zeiss lens-based system works in combination with the camera-based stabilizer on the A7 II series, which offers up to two stops of anti-shake on original A7 bodies without stabilization. On paper that’s not as impressive as the latest Nikon/Canon stabilization systems, which now offer up to four stops, but in reality, a two-stop system allows for shutter speeds as slow as 1/30 sec. on an 85mm lens, which is useful when shooting weddings or events in low-light conditions. The large manual focus ring offers precise adjustment and the Zeiss Batis 85mm f/1.8 offers a minimum focus distance of 80mm. While that’s comparable to the minimum focus distance on many competitors’ fast-aperture 85mm primes, it means the Zeiss Batis isn’t well-suited for close focus photography, such as pack and product shots, with macro lenses such as the Sony FE 90mm f/2.8 a better option. Like the Batis 25mm f/2, the 85mm f/1.8 version offers Zeiss’s innovative OLED display on the lens barrel for reading focus distance and depth-of-field information. 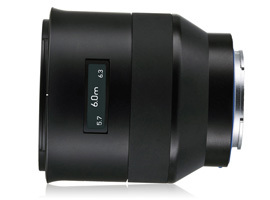 The front element uses a 67mm thread for filters, and the 85mm focal length provides a 29-degree field of view. 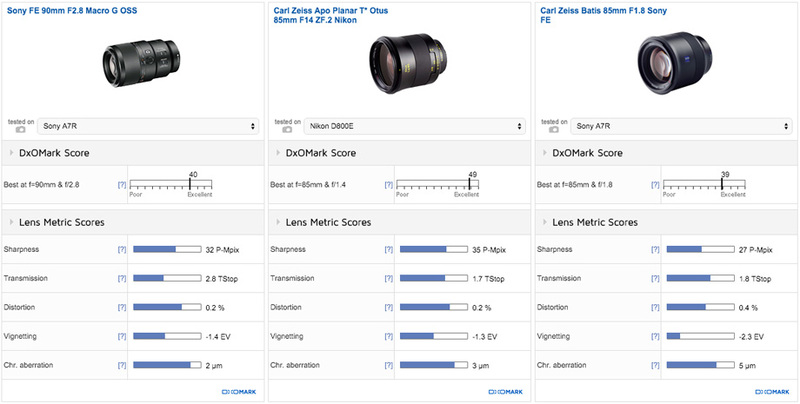 Our technicians have been busy analyzing the Zeiss Batis 85mm f/1.8’s lab results, and we’re pleased to reveal the verified scores. Achieving an overall DxOMark score of 39 points, the Zeiss Batis 85mm f/1.8 is an excellent performer. 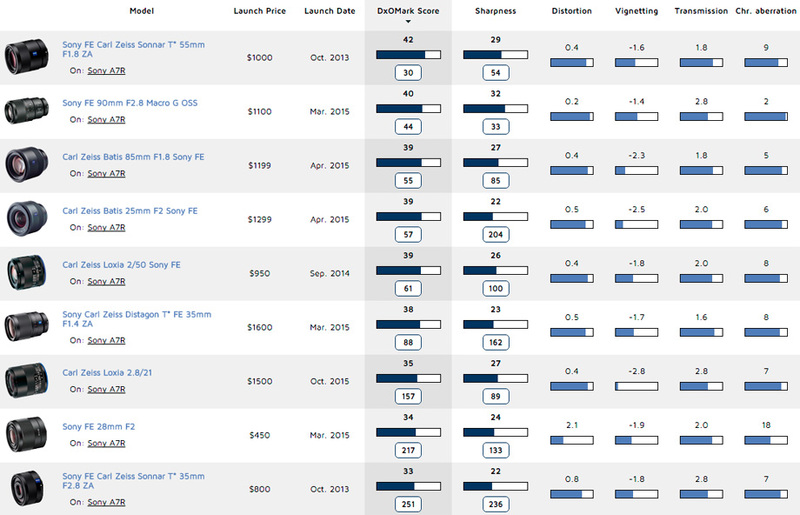 Against some fierce competition, it ranks among the top 10 for all short telephoto primes between 85mm – 100mm we’ve tested, and third place for FE-mount lenses behind the Sony FE 90mm f/2.8 and the Zeiss Sonnar T 55mm f/1.8. Boasting good overall sharpness of 27 P-Mpix, the Zeiss Betis 85mm f/1.8 isn’t far behind the sharpest lenses we’ve tested on the Sony A7R, offering uniform and strong resolution between f/4 and f/11. At the wider aperture settings, good center resolution is recorded, with just a little drop-off in the outer field, and at f/22, sharpness levels drop to around 60%, but remain homogenous across the frame. Fairly heavy vignetting of –2.3EV occurs at the widest aperture settings, but from f/4 through to the minimum f/22 aperture, it’s well-controlled. Chromatic aberration is also well-controlled at all apertures, as is distortion, with only a tiny bit of pincushion curvature evident. Tested on the 36Mp Nikon D800E or the 50Mp Canon 5DS, the Zeiss Otus 85mm f/1.4 is one of the highest-scoring and sharpest lenses we’ve tested. Offering outstanding and homogenous resolution at all aperture settings, and solid results across all its lens metrics, the Otus 85mm is phenomenal for super-resolution Nikon and Canon DSLRs. Costing $4490, it’s also one of the most expensive solutions, however, and although it’s possible to use the Otus 85mm on the A7 series via an adapter, it’s currently a compromise solution for the Sony mirrorless system. 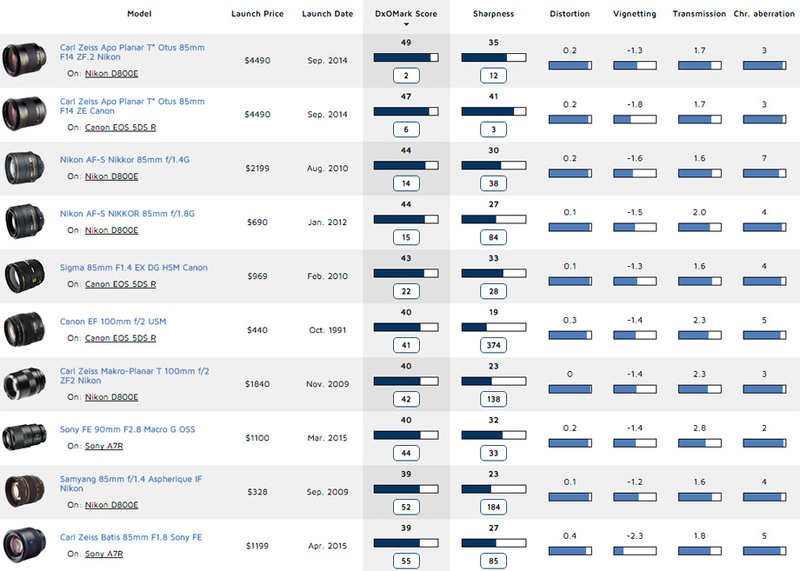 Comparing the more affordable and dedicated FE-mount 90mm f/2.8G OSS ($1,098) and the Zeiss Batis 85mm f/1.8 ($1,199), there are pros and cons for each. As mentioned, if close-up macro photography is a requirement, the 90mm f/2.8G is the one to go for, but it’s a stop slower than the Batis 85mm f/1.8, making the Zeiss preferable for low-light or creative portrait work. For sharpness, the FE 90mm offers uniform resolution at all apertures and excellent sharpness over 70% between f/2.8 – f/11. While the Batis 85mm f/1.8 features strong center sharpness at its wider aperture settings, it’s not homogenous until f/4, and while still very good at mid-apertures, it’s not quite as sharp as the Sony FE 90mm f/2.8. The Zeiss Batis 85mm f/1.8 does have slightly better results for chromatic aberration at wide apertures compared to the Sony FE 90mm f/2.8, but it’s not really an issue on either lens at any aperture. The Zeiss Batis 85mm’s lowest vignetting score of –2.3EV occurs at the maximum aperture and will require some correction, but close down to f/2.8 and things improve markedly, with slightly better vignetting than the Sony FE 90mm f/2.8 at the same aperture. Sony A7 mirrorless cameras, and particularly the super-high-resolution A7R series, demand top-quality, fast-aperture prime lenses to get the best from their sensors. Meeting this need in its new Batis line up, Zeiss has taken its renowned excellence for build and optical quality, and have improved functionality with the addition of autofocus, an OLED barrel display, and in the case of the Batis 85mm f/1.8, image stabilization. While not cheap, the $1,199 Zeiss Batis 85mm f/1.8 offers good value for money, considering the solid Zeiss construction, features, and performance. On the A7R, it’s not quite as sharp as the similarly-priced Sony FE 90mm f/2.8, but sharpness is still very good. What’s more, with improved light transmission thanks to that faster f/1.8 maximum aperture, the Zeiss lens is better suited for low-light event photography, as well as creative portraiture, over the Sony. We can’t wait to pit the Zeiss Batis 85mm and the Sony FE 90mm against the new Sony 85mm f/1.4GM just as soon as we get one in the lab.